For the week, the Dow added 0.8% (down 7.2% y-t-d), while the S&P500 was little changed (down 7.4%). The Transports were down 1.9% (up 12.7%), while the Utilities rose 2.4% (down 3.6%). The Morgan Stanley Cyclicals added 0.2% (down 5.7%), and the Morgan Stanley Consumer index gained 0.5% (down 6.3%). The broader market gave back some recent out-performance. Both the small cap Russell 2000 (down 4.2%) and the S&P400 Mid-Caps (up 0.9%) declined 0.9%. The NASDAQ100 declined 1.2% (down 5.7%) and the Morgan Stanley High Tech index fell 1.1% (down 4.2%). The Semiconductors dropped 2.9% (down 3.5%). The Street.com Internet Index dipped 0.2% (down 2.7%), while the NASDAQ Telecommunications index added 0.2% (up 2.0%). The Biotechs lost 2.2% (down 4.6%). The Broker/Dealers added 0.4% (down 21.6%), while the Banks sank another 4.2% (down 24.8%). With Bullion sinking $32.30, the HUI Gold index was clobbered for 7.7% (down 2.7%). One-month Treasury bill rates increased 13 bps this week to 1.86%, and 3-month yields rose 14 bps to 1.97%. Two-year government yields surged 66 bps to 3.03%, according to Bloomberg the largest weekly gain in yields in 26 years. Five-year T-note yields surged 55 bps to 3.73%, and 10-year yields jumped 34 bps to 4.26%. Long-bond yields gained 18 bps to 4.79%. The 2yr/10yr spread narrowed 22 to 123 bps. The implied yield on 3-month December ’09 Eurodollars shot 72.5 bps higher to 4.555%. 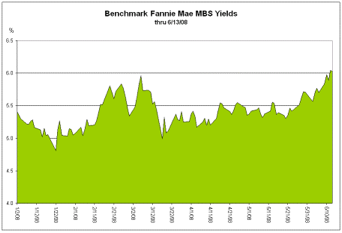 Benchmark Fannie MBS yields rose 36 bps to 6.07% (high since Aug 20). The spread between benchmark MBS and 10-year Treasuries widened 2 bps to 181. The spread on Fannie’s 5% 2017 note narrowed 3 bps to 70.5 bps, and the spread on Freddie’s 5% 2017 note narrowed 2 bps to 71 bps. The 10-year dollar swap spread declined 4.5 to 70. Corporate bond spreads were mixed to wider. An index of investment grade bond spreads widened 1 to 111 bps, and an index of junk bond spreads narrowed 15 to 579 bps. Investment grade issuance included SLM $2.5bn, Florida Power $1.5bn, American Express $500 million, Duke Energy $500 million, FPL Group $500 million, Sotheby's $500 million, Sempra Energy $500 million, and Union Electric $450 million. Junk issuers included Sequa Corp $500 million, and Targa Resources $250 million. Convert issuance this week included Sotheby's $175 million. International dollar bond issuance included Rabobank $3.4bn and Arantes International $150 million. German 10-year bund yields jumped 22 bps to an 11-month high 4.64%. The German DAX equities index dipped 0.6% (down 16.1% y-t-d). Japanese 10-year “JGB” yields gained 7.5 bps to an 11-month high 1.86%. The Nikkei 225 dropped 3.6% (down 8.7% y-t-d and 21.2% y-o-y). Emerging debt markets were under pressure and equities were mostly lower. Brazil’s benchmark dollar bond yields surged 27 bps to 6.33%. Brazil’s Bovespa equities index dropped 3.7% (up 5.2% y-t-d and 26.8% y-o-y). The Mexican Bolsa fell 2.4% (up 3.0% y-t-d). Mexico’s 10-year $ yields jumped 23 bps to 5.33%. Russia’s RTS equities index added 0.2% (up 2.9% y-t-d). India’s Sensex equities index fell 2.5%, boosting y-t-d losses to 25.1%. China’s Shanghai Exchange index was clobbered for 14.4%, pushing 2008 losses to 45.5%. Freddie Mac 30-year fixed mortgage rates surged 23 bps to a 7-month high 6.32% (down 42bps y-o-y). Fifteen-year fixed rates jumped 28 bps to 5.93% (down 50bps y-o-y). One-year adjustable rates increased 3 bps to 5.09% (down 66 bps y-o-y). Bank Credit declined $4.2bn to $9.376 TN (week of 6/4). Bank Credit has expanded $163bn y-t-d, or 4.0% annualized. Bank Credit posted a 52-week rise of $821bn, or 9.6%. For the week, Securities Credit increased $7.9bn. Loans & Leases declined $12.1bn to $6.899 TN (46-wk gain of $574bn, or 10.3% annualized). C&I loans fell $7.1bn, with one-year growth of 18.7%. Real Estate loans dipped $1.6bn (up 3.4% y-t-d). Consumer loans were little changed, and Securities loans declined $2.2bn. Other loans decreased $1.0bn. Examining the liability side, Deposits sank $36.4bn and "Borrowings" rose $11.6bn. M2 (narrow) “money” supply declined $11bn to $7.694 TN (week of 6/2). Narrow “money” has expanded $231bn y-t-d, or 7.3% annualized, with a y-o-y rise of $466bn, or 6.4%. For the week, Currency added $1.1bn, and Demand & Checkable Deposits increased $17.8bn. Savings Deposits dropped $26.2bn, and Small Denominated Deposits declined $2.4bn. Retail Money Funds slipped $1.2bn. Total Money Market Fund assets (from Invest Co Inst) declined $5.0bn last week to $3.515 TN, reducing the y-t-d rise to $402bn, or 29% annualized. Money Fund assets have posted a one-year increase of $985bn (38.9%). Asset-Backed Securities (ABS) issuance increased this week to $6.3bn. Year-to-date total US ABS issuance of $100bn (tallied by JPMorgan's Christopher Flanagan) is running at 27% of the comparable level from 2007. Home Equity ABS issuance of $303 million compares with 2007's $184bn. Year-to-date CDO issuance of $13.8bn compares to the year ago $208bn. Total Commercial Paper jumped $16.4bn to $1.772 TN. CP has declined $452bn over the past 44 weeks. Asset-backed CP rose $8.5bn last week (44-wk drop of $434bn) to $761bn. Over the past year, total CP has contracted $349bn, or 16.5%, with ABCP down $394bn, or 34%. Fed Foreign Holdings of Treasury, Agency Debt last week (ended 6/11) increased $2.7bn to a record $2.304 TN. “Custody holdings” were up $248bn y-t-d, or 26% annualized, and $349bn year-over-year (17.8%). Federal Reserve Credit declined $4.2bn to $873.5bn. Fed Credit is little changed y-t-d, while having increased $23.5bn y-o-y (2.8%). International reserve assets (excluding gold) - as accumulated by Bloomberg’s Alex Tanzi – were up $1.405 TN y-o-y, or 26%, to $6.822 TN. The dollar index rallied 2.4% to an almost 4-month high 74.15. For the week on the upside, the Pakistani Rupee increased 1.7%, the Uruguayan peso 1.0%, and the Argentine peso 0.8%. On the downside, the Norwegian krone declined 3.0%, the South African rand 2.5%, the Swedish krona 1.9%, the Swiss franc 1.8%, the Japanese yen 1.7%, the Euro 1.7%, the Danish krone 1.7%, and the British pound 1.4%. Gold sank 3.6% to $870, and Silver fell 5% to $16.56. July Crude declined $4.09 to $134.45. July Gasoline fell 2.4% (up 40% y-t-d), and July Natural Gas slipped 0.6% (up 69% y-t-d). July Copper declined 0.9%. July Wheat surged 8.8% and Corn 12.4%. The CRB index gained 1.0% to a new record high (up 24.3% y-t-d). The Goldman Sachs Commodities Index (GSCI) declined 0.3% (up 37.7% y-t-d and 70% y-o-y). I’ll make just brief comments as to why I believe Dr. Bernanke’s view is too optimistic. First, since March the Fed’s Wall Street bailout and the concurrent collapse in market yields played a significant role in artificially bolstering the U.S. economy. The unwind of market hedges also worked to support marketplace liquidity and likely artificially boosted Credit Availability – especially for conventional mortgages and the investment grade corporate sector. I believe these forces have by now likely run their course. Moreover, market liquidity will likely suffer as hedges are put back on. The risk that our economy has entered a substantial downturn has actually increased markedly over the past several weeks. Importantly, energy costs have risen significantly to the point of being economically destabilizing. The combination of spiking energy and food costs has created the worst global inflationary backdrop since the seventies – a dangerous predicament only belatedly appreciated by global policymakers. Central banks across the globe have begun to react, and vulnerable global bond markets are under heavy selling pressure. There is today great uncertainty as to the consequences of a global spike in bond yields. Importantly, the Fed’s aggressive “reflation” is being stopped dead in its tracks by market forces. U.S. market yields are moving sharply higher, with benchmark MBS yields now all the way back to last summer’s levels. This is forcing another round of speculative de-leveraging in the highly leveraged mortgage Credit market, which is tantamount to a further tightening of already tight mortgage finance conditions. This is another huge blow for the vulnerable Bubble Economy. 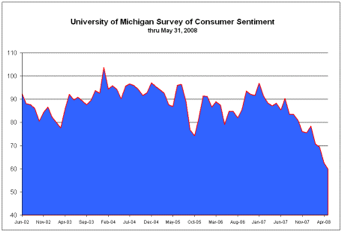 The University of Michigan Consumer Confidence index posted its high of 112 back in the first month of 2000. By the beginning of 2003, it had sunk all the way down to 78. Yet during this period of weakening consumer sentiment and general economic conditions, benchmark MBS yields dropped from over 8.0% in mid-2000 all the way down to 4.2% by June 2003. Repeatedly over the past (“dis-inflationary”) 20 years, waning economic activity has been bolstered by sinking mortgage yields and resulting stimulus to housing and home-equity withdrawal. It was like clockwork, but now this important cycle has been broken. Since January, Consumer Confidence has plunged from 78.4 to 56.7, while MBS yields have jumped from 5% or so to above 6%. I have argued that the Fed’s latest reflation would prove problematic. On the one hand, reflationary forces would bypass burst Bubbles in Wall Street finance and U.S. real estate markets. On the other, an over abundance of cheap U.S. and global liquidity would further destabilize heightened inflationary pressures globally and stoke Acute Monetary Disorder. As has become clear of late, the upshot to this dynamic is intensifying inflationary pressures in the face of a weakening U.S. economy. Indeed, one can look to spiking energy, food and borrowing costs and make a strong case that Fed reflationary policies have become dangerous and counterproductive. From examining Q1 “Flow of Funds,” one could identify how double-digit growth in Bank Credit, agency MBS, and the Money Fund Complex was carrying the load for a busted Wall Street securitization Credit apparatus. Recent developments, however, have the sustainability of robust Bank Credit and MBS in serious doubt. And while 9.7% fiscal y-t-d federal spending growth (see “Fiscal Watch”) has thus far played a meaningful role in supporting the economy, the bond market for the first time in years must come to grips with the confluence of surging yields and the prospect of massive ongoing federal deficits. Similar to the Fed’s reflation policies, federal government stimulus is not without significant costs and risks. Acute global inflationary pressures ensure the old "free lunch" monetary and fiscal stimulus come these days with a hefty price tag. It has not taken long for Stage II of this unfolding historic crisis to demonstrate some of the classic old financial and economic headaches. I’ve always believed the most problematic scenario for the highly leveraged U.S. Credit system and Bubble Economy would be an inflationary surge and resulting spike in market yields. Curiously, just as the possibility of such a dismal scenario gains momentum a bullish consensus develops that the worst of the crisis is behind us.